Five-time Tour de France champion Bernard Hinault's call for riders to strike in this year's race in protest against Chris Froome are "irresponsible and ill-informed", say Team Sky. Froome returned an adverse drugs test during last year's Vuelta a Espana win. Team Sky said it was "disappointing" Frenchman Hinault, 63, "repeated factually incorrect comments about a case he clearly does not understand". 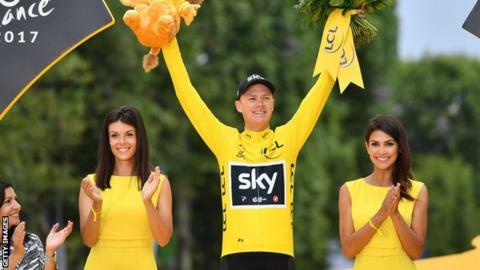 Froome, who won last year's Tour, became the first Briton to win the Giro d'Italia last month and the seventh man to complete a Grand Tour hat-trick, holding all three titles at the same time. In December 2017, a leaked report revealed he had exceeded the permitted levels of salbutamol - a legal asthma medication - during his Vuelta win three months earlier. He is still under investigation from world cycling's governing body the UCI, but has continued to compete and "expects" to win the anti-doping case. Hinault told French newspaper Ouest France: "The peloton should dismount and go on strike saying, 'If he's at the start, we're not starting! "The peloton is too nice. Others have been sanctioned with everyone in agreement, but they will not sanction him because it is an [adverse finding]? No, it is not. "Christopher Froome should not be at the start of the Tour. Quite simply because he has tested positive, for me this is not an abnormal test. "As always, people do not take the decision when it should be taken. The people at the UCI should have said, you have been caught, so you should not be racing." Team Sky said they and Froome would not let Hinault's "uneducated" comments affect their preparation. "His [Hinault] comments are irresponsible and ill-informed," the team said. "Chris has not had a positive test, rather an adverse analytical finding for a prescribed asthma medication. As an ex-rider himself, Bernard will appreciate the need for fairness for each and every athlete. And at the current time, Chris is entitled to race. "Both Chris and the team are following the process that has been put in place by the UCI."